First LILLY MAE arrived on May 7. She and her litter mates were left on a canal and luckily they found their way to a vet tech at the Arizona Equine Hospital. All have found homes. 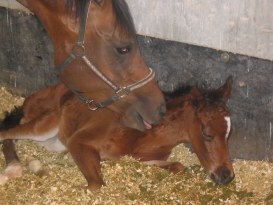 MP Emma, is a first time Mom, and so she surprised us by not showing any signs of foaling that night -- we had a camera monitoring her, but Lilly Mae didn't wake me in the wee hours to go out and so I slept right through the excitement. But I did get to see her first steps. 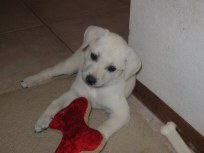 "EmmiLee" , age 7 months, is FOR SALE! Click on her photo for more information. This filly has outstanding bloodlines and has been handled since birth -- don't miss out on this opportunity! I will be having a new page, "Rockin D Babies" coming soon! 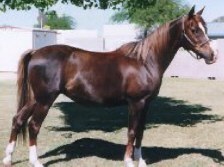 We also have new listings for Arabian horses that are for SALE! 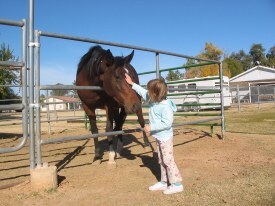 Click here: "Horses for Sale"
Daisy has grown up to be as tall as big brother, Luke. December 2006. 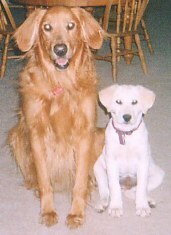 The photo below was taken shortly after getting Daisy in May 2004 -- she has really grown! 5 year old mare, MP Emma! "Emma" came here in June for boarding and we connected almost immediately. Not having been handled very much, I spent a lot of time getting her confidence and found out how sweet she was and how she loved attention and what a quick learner she was. She came up for sale around the first of December and there were a couple of people interested in her. I couldn't get the thought out of my mind that I should buy her even though my body is wearing out and I already have 3 horses! But the thought wouldn't leave and the seller made me and a friend an offer we couldn't refuse. She is in foal, but the foal will go back to the seller. So Paul and I and our friend, Marsha, now own this beautiful mare -- what an exciting 2008 we will have! I have learned never say never! ZA Star Zapphire (Taffy), pictured here in May 2006 , has an updated website all of her own -- check it out! 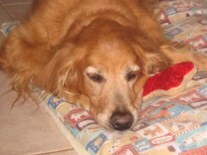 September 2006, age 8 1/2 years old. We have new Arabian horses for sale! 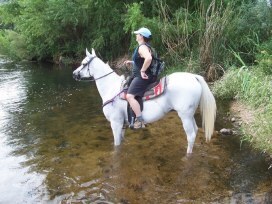 Check out "Horses for Sale" link..
Look where Auntie Meg and I went this morning! I had so much fun! Megan woke me up this morning at 5am and we were at the river by 6am and stayed until 10am - I am soooo tired (well, Megan is probably way more tired than me!) We played in the water and I even got to see four deer! They weren't even that scary! I think this is the same place that I went when I was little, but I'm not sure. I didn't want to go in at first, but the water felt so good on this warm day. I even drank and splashed in it and there was some grass floating down the river and I grabbed it and had a snack! My new friend Whiskey went with us and he had fun too! During this time of year, don't forget to enjoy your horses and all that Nature has to offer! 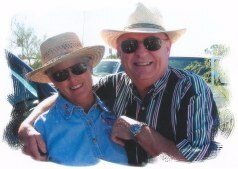 Please click above on all our pages to view various pictures of our life in Arizona, our wonderful Arabians, and interesting links. 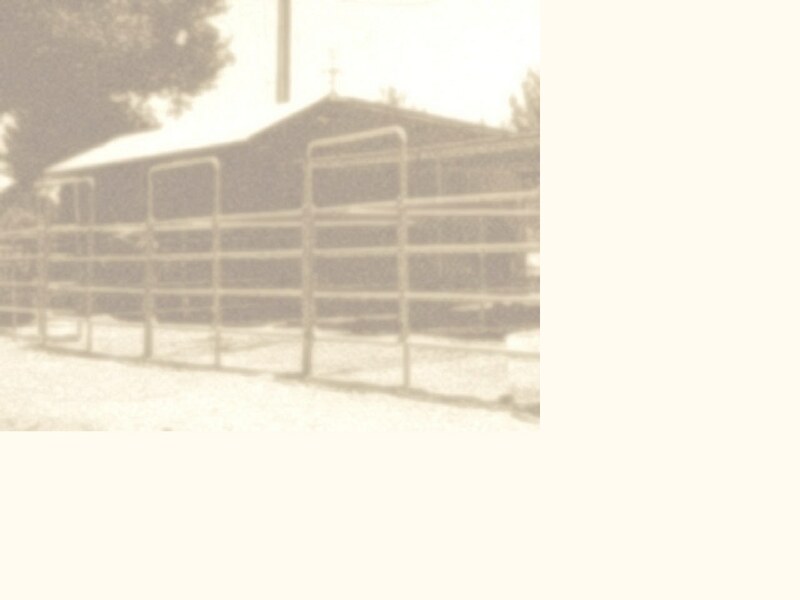 Rockin D Arabian Horse Ranch -- top left, looking east with small pasture and round pen and grassy area for "arena" work; top right is looking west toward the entrance to our development. We now have an 8 foot block wall behind the stalls and no telephone poles and a 6 foot wall along the western edge as shown in the lower left. This area also serves as pasture. 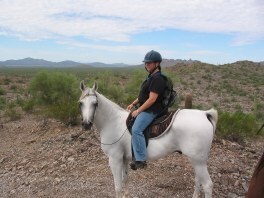 We are a small, private facility raising Arabian and Half-Arabian horses for pleasure riding and showing, located in Gilbert, Arizona. We currently have stalls, outside covered or barn with runs, available for full-care boarding. 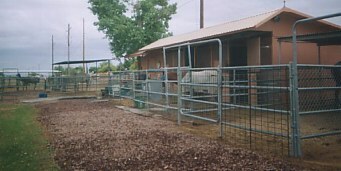 We offer TLC with lots of carrots, automatic waterers, misters, barn fans, round pen and canal riding. 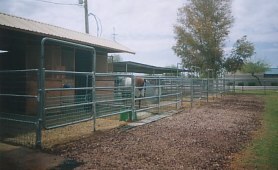 Stalls cleaned twice a day and we offer individualized feed programs. Trainers, vets, and farriers nearby. Operating since 1984 and references available. 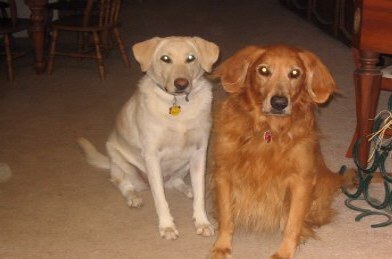 Board starts at $225.00 per month and all breeds are welcome! 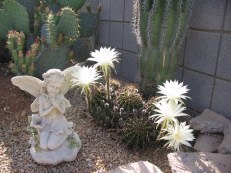 For more photos of our place and surrounding areas, click here. or a long-term interest to own a horse? to approved riders. Call or email for details.